Leather full sole ballet shoe. Features cotton drwastrings and included elastics. Only while stocks last. Dansoft is an ideal leather student ballet shoe with a full sole and elastic already attached over the instep. It has a strong yet flexible upper and a cotton lining. Leather ballet slippers with split soles and cotton lining and pre-sewn instep elastic. The syllabus low heel character shoe is made with a black canvas upper and soft suede sole, giving a superb lightweight flexible fit. It was designed and developed by Katz to the exact specifications of the Royal Academy of Dance. The lining on the inside of the shoes, is made of a microfiber material for a velvety soft feel. The box is made of pliable materials which mold to the shape of the foot and simulateneously reduce noise while dancing. 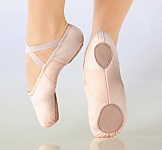 Because of the 3/4 sole it is very easy to roll onto pointe. 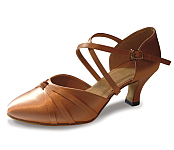 The Glissé features a broader, "feathered", hand-molded toe-box with a wide platform and long vamp. It's U-shaped throat allows the dancer to roll straight from flat to pointe with more support, more comfort and a better overall line. Elastic Drawstring.These shoes are rather small - therefore, please choose a full size up from street shoes. 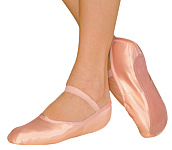 Matching ribbon, toe pads and toe caps are found under "Accessoires"
The Studio Pointe Shoe is built to be quieter and last longer. Features a tapered reinforced toe box, round vamp and reduced sides. Pleated tie with quiet toe construstion. New elasticised binding encases an elastic drawstring to reduce bagging at the heel cup, while on pointe. Short leather outsole and new cotton wrapped shank. 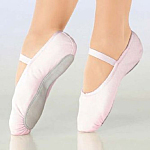 Full sole satin ballet shoes with a cotton drawstring - elastics are included. The Gamba 93 is designed for the beginner to advanced dancer. It features a wide platform for better balance and a fairly wide box with flexible wings. 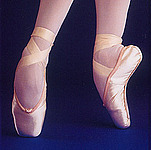 They allow better insole bend and allow the dancer to go through releve, from flat to demi to full pointe. The full shank is available in medium and hard. 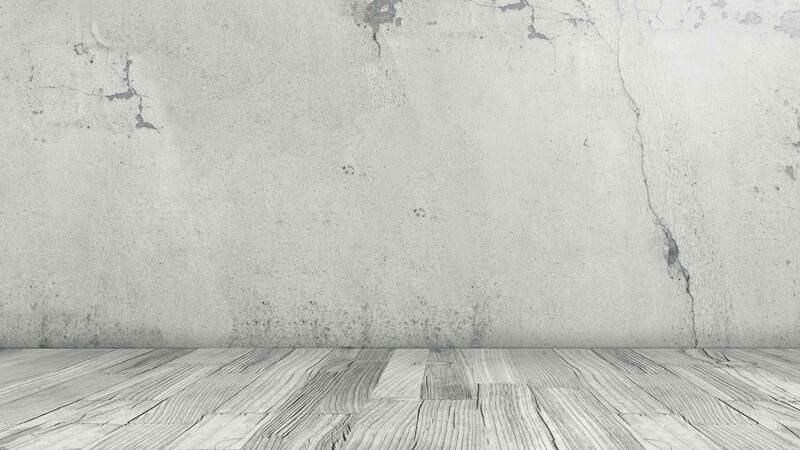 The Gamba 97 is designed for the more advanced dancer and ranges from narrow to extra wide. It features a wide platform for better balance and a fairly wide box with flexible wings. 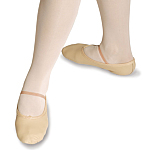 They allow better insole bend and allow the dancer to go through releve, from flat to demi to full pointe. The shoes have a 3/4 length fiber carbon shank which comes in medium and hard strengths. Hard shank for very high arch and strong instep, or heavier dancers. A higher vamp provides extra support and prevents the foot from falling forward. A flat outsole enables the dancers to maintain balance while standing flat, preventing the foot from rolling from side to side. New article by Temps Danse: "Tube Warmer" with a variety of possibilities of usage. Can be worn as a kidney warmer, bandeau top or a skirt. Made of viscose/spandex mix for high wearing comfort and shape and colour retention. Bella is a newly engineered style to provide a better fit for today's feet.The vamp is a 1/4 of an inch shorter than the Glisse and is good for toes of uneven length. Slightly tapered, feathered toe box. Medium vamp, low sides. Round shape throat. Hand flattened crown. Wide, high platform. Cotton lining. Nylon binding with elastic drawstring. Short leather outer sole.129: #3 leather board shank, ¾ skived to zero.129MS: #5 leather board shank, 3/4 skived to zero. Matt Nylon/Lycra sleeveless leotard with front lining and gathered bustline. A beautiful sleeveless leotard featuring a front lining, gathered bustline and round, middle high back line. The syllabus cuban heel character shoe is made with a black canvas upper and soft suede sole, giving a superb lightweight flexible fit. It was designed and developed by Katz to the exact specifications of the Royal Academy of Dance. Camisole Leotard with matching belt. "Cygnet" by Freed:High quality leather ballet shoe, Made in England!Full suede sole. This crop style warm up top in versatile acrylic has long sleeves with a slip stitch cuff for added detail with a neat front tie fastening. Beautifully soft and comfortable makes this ideal for warm up and class wear. Greek Sandals. Leather upper, suede soles. Warm up Shorts with a high waistband which can be turned over oder worn over the breast if extra warmth is required. It is made of a luxurious Viscose/Angora mix for a touch of class. 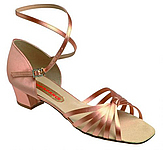 A basic student jazz shoe. Jazzflex features a flexible full suede sole running over a rubber heel. RAD sleeveless leotard with scooped neck and a matching belt. Sweat Pants by Freed of London made of Nylon. Elastic waistband. Rip Stop warm up trousers. A beautiful sleeveless leotard with attached skirt, featuring a front lining, gathered bustline and round, middle high back line. Robust dance pants offering a lot of movement for dancing or working out. Capezio Flash Waist Pant from the new Capezio ACTV Sports Range. offer a wide and comfortable fit with a foldable waistband. Features pink stitching and buttons for the finishing touches. The latest Merlet canvas ballet shoes have arrived, featuring elastic drawstrings and two attached elastics. These split sole cavas ballet shoes have a hand stitched sole construction with no external stitching and are assembled on a stretched last to reduce folds. Folds are further reduced by the somewhat narrower front and the well known Merlet elastic between the two sole patches. Thong shaped suede upper fits between the big toe and the second toe. The half-sole covers the ball of the foot for protection during turns. The short elastic straps help the shoe hug the foot. 3” Flared Heel. Ankle Strap. Speed Buckle.2 Strap Channels. Kid Skin Leather/PU.Includes 1 Set Heel Covers & Shoe Bag.Elasticated Strap - Patent Pending. Soft meryl, double-strap leotard with front lining, featuring an empire line, a gathered bust section made of pierced Meryl and tripple straps at the back decorated with rhine stones. 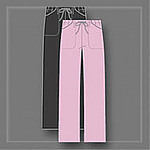 Ideal for salsa with the look of a skirt but the comfort of pants.Waistband can be pulled down. 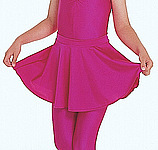 Camisole leotard made of high quality Supplex (breathable and drying fast).Gathered at the front.Two princess seams in the front.The colours and the form still looks like new even wash after wash.
Children's sleeveless leotard by "Dancin Ballet und Mode" with frills on the hips.Made from soft cotton. Low cut back. Capezio's latest innovation is the Airess pointe shoe. This new shoe includes multiple variations. Airess features two distinct toe shapes and is available in three shank strengths. The shoe is designed to provide long-lasting wear in class and rehearsal and encourages maximum articulation of the foot in performance. Warm Up Trousers by Repetto Paris, made of soft cotton with a comfortable ribbed waistband and a back pocket. 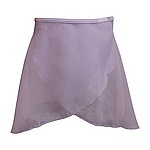 Basic Skirt "Versus" by Temps Danse for Jazz Dance made of soft viscose.Straight princess seams. Classic introductory ballet flat with split soles. Leather upper with cotton lining. Classic wide Jazzpants. High waist with rubber waistband.Made of soft und comfortable Supplex. This beautiful Meryl princess seam camisole leotard has a slimming vertical ribbed panel on each side and features a full front lining. This beautiful Meryl princess seam camisole leotard with attached skirt has a slimming vertical ribbed panel on each side and features a full front lining. Children's Leotard "Amy" by Adagio Ballet Wear (Gandolfi) made of soft cotton, short sleeved.Round neck and slightly deeper back. The shorts "Orus" ist from the newest Temps Danse collection.It is form hugging, featuring a 3 cm wide ribbed waistband and a back pocket. The curved v-shaped legline gived the shorts a feminine touch. It is made of Viscose and pleasant to wear.Maintenance tips: washable at 30°C. Not suitable for the tumble drier. Beautiful loose fitting top, created for yoga or dance but also suitable for street wear. All leather buckle bar shoes featuring a 3,5 cm heel. Sauna Pants by Express Dance Supplies made of Nylon with rubber waistband and at the cuffs. Cross over short sleeved top featuring a V-neckline. This allows the top to be tied either to the front or back. 2.5" Flared Heel. Brogue Oxford Details. Ankle Strap.Speed Buckle. Elasticised Straps.Includes 1 Set of Heel Covers & Shoe Bag.BLG Nubuck/Kid Skin Leather, FWN Nubuck. 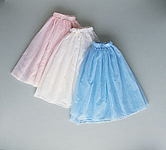 *NEW* Pre-primary & primary Grade georgette petal skirt with cotton waistband and Velcro fastening. 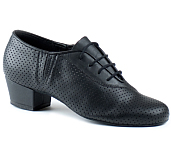 PU tap shoe with fitted toe taps - ideal for beginners. Jazzpants by Le Papillon, straight fit made of soft Supplex.Tight fit. Soft and comfortable high waist with waistband. Aura is a top with integrated bra, making it sporty and casual. Aura works ultra feminine thanks to its pleats. It is made of a bi-stretch, very soft and very absorbent viscose. The inner bra provides a moderate support that can be enhanced by wearing a sports bra and the fluid tank shirt on the top offers you a maximum of comfort. Elan is a crop top in a wonderfully soft dark grey marl viscose material. It has a loose cut, featuring a pinch front. It is somewhat longer at the back. It can be used as a warmup garment but looks just as great over a top or sports bra. Short sleeved boat neck leoatard featuring a round middle deep back cut. The leotard ist white in colour with a violet print. Made of tech-mesh and synthetic leather combination, this shoe features the usual arch support with cushioning for shock absorption. The lightweight, non-marking PU ousole has patented built-in flex points that help gapping and offer great flexibility. V-neck ribbed sweater with long sleeves. 4-way stretch. "Collant Coton Lycra! : Leggings by Repetto Paris. Comfortable high waist with elastic waistband. Long sleeved wrap shirt by Repetto Paris. Made of super soft and warming fleece. Sleeveless Leotard by Repetto Paros made of Satin Lycra with peplum at the waist. Classic round neck and back. Children's Jazz Shoe "Peps Canvas" made of black canvas with textile material inside.Suede leather sole and small heel that is also covered with suede leather. Leona. Daimante adjustable Buckle Vamp Available in 2 1/2 inch Slim Flare Heel. Classic R.A.D. long sleeved Leotard "Sarah" by Freed of London.Round neck and back, deep back. Sleeveless Leotard "Angela" by Adagio Ballet Wear (Gandolfi) made of cotton.Suitable for RAD.Princess seam at the front, gathered V-front.Deep and round back. Matching belt. Tank top featuring a combination of two material types - smooth and ribbed Viscose. Top OLIS ist from the newest Temps Danse collection. The feminine look underlines the shape of the female body, but at the same gives support with a fully lined top part. The back line is moderately high and the lower part of OLIS ist made of a ribbed Viscose for a sporty, body hugging look. Shorts with a broad waist band which can be rolled over or left high. Atal has back pockets and short side slits for comfort and freedom of movement. Desir is a stiking dance dress made of a soft, flowing stretch material. The double spaghetti straps are crossed at the back and the dress ist cut slightly longer at the back than in the front. The tulle inserts in the front and back give the dress a very special feminine look, making it suitabel for all types of dance like modern, salsa, or tango. This Princess seamed leotard has a classic ballet legline and a body contouring fit. 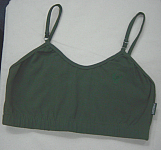 Adult styles feature a shelf bra liner. Jazz pants with a very fine, close knit construction and a matte finish. This fabric features excellent recovery, resistance to creasing and the durability of nylon. The garment is made with a performance finish that wicks moisture from the body and dries quickly. Clean finish elastic waist. Classic long sleeved wrap shirt by Repetto Paris. Made of warming cotton mix. This elegant classical leotard features long sleeves and a deep rüsched back. The leoatard has an excellent fit and a full front lining for support. Straight Jazzpant "Volodia" by Temps Danse.Made of soft viscose, with a comfortable rubber waistband.Tight fit at the hips and wider leg.White tattoo print on the left side of the hip. Teatre is perfect for both warm-up sessions and streetwear. This item features a wide, round neckline and loose fitting for perfect ease. The fine unobtrusive lurex yarn gives the garment a light silvery sheen. Whether you need comfortable pants for dancing, yoga or even streetwear, ASTRO by Temps Danse is the richt choice. It is not only comfortable, but sophisticated and smart as well. It features an elastic flat waistband with a drawstring and pleats in front which gives it an elegant touch. Short sleeved leotard in flamenco style. Mid low cut neck and back.Made of breathable Lycra.Gathered sleevels that are underlayed in black.Perfect in combination with a black skirt or to wear alone. 2.5” Flared heel. Ankle T-Strap. Speed Buckle.Calf Skin Leather.Includes 1 Set of Heel Covers & Shoe Bag. Mandy Nylon/Lycra leotard with camisole top, low back, panelled bodice and shoulder straps. Cotton/Spandex sleeveless leotard with gathered bustline. Basic Leotard with broad straps by Repetto Paris.Made of shiny Satin Lycra.Round neck and back. Sleeveless Leotard by Freed of London with broad straps, round neck and back and a gathered front. Classic Women's Jazzpant by Ginadan made of Supplex. Cottony, soft and strong material. Breathable, quick drying, lightweight and practical.Straight fit and high waist with waistband. Camisole Leotard by Adagio Ballet Wear (Gandolfi) made of soft cottin.Suitable for RAD.Deep and round back.Princess seam in the back.With matching belt. Sport top with racer back. The shaping lines and front lining give excellent support. The top combines functionality and femininity. It is hard-wearing and keeps it shape and colour wash after wash.
Banana by Temps Danse: Short sleeved loose fit shirt made of high quality viscose.Front side is grey and the back is black, white sleeves.V-front and small logo print. Jazzpants "Volute" by Temps Danse made of soft viscose.Elegant knotted style at the waist. Perfectly matching a basic leotard or shirt.Straight fit. The Temps Danse sleeveless T-Shirt ACID has a fluid straigt cut for perfect comfort and features a round neckline. This item is not only suitable for the dance class, but can easily be mixed and matched with streetwear. Closed toe shoe with ankle strap. Scallop detail. Raceback style tank top features built in shelf bra for comfort and enhanced performance.Soft micropoly fabric is perfect comfortwear for yoga. Ohm print at back neck adds subtle flair. A premier jig shoe which offers a host of comfort and performance features. The shoe has a flexible black suede sole, high density leather uppers, reinforced leather lining and straps. Comfort is assured with a soft padded ankle, padded tongue and sports insole. 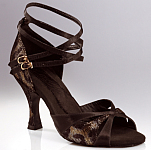 X-Straps, Coag/Brocade, 2,5" flared heel, quick fasten buckle, leather lining and a super-flexi soel. Georgette wrapover skirt by Roch Valley. 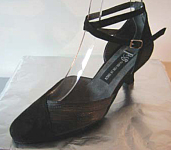 Felicity Ladies Ballroom/Latin Shoe closed toe with T-bar straps, and 2.2" flared heel, in Black Nubuck. Leggings by Repetto with High-Waist. Made of soft cotton, tight fit. Dancesneaker "Jam" by Rumpf that gives stability because of the full sole.Made of suede leather and mesh. Classic children's camisole leotard by Le Papillon with a straight back in shiny pearl white. Made of soft lycra. Diagonal Skirt by Le Papillon, especially for latin dance.The soft Supplex falls smooth and elegant.Flared hem. Tap Shoe "Jazz Tap" by Katz Dance.This Tap Shoe is made of high quality leather, inside is canvas.Full Leather sole with a small heel. Taps have to be attached.Lacing. Leather Sandal with 5 strip vamp, and looped T-bar with diamante detail.Buckle also decorated with rhinestones. Longsleeved Top by LaLaChaCha with front print on the right side, open seams, stitching, and velvet application. Cotton-mix guarantees best wearing comfort. Unisex hip hop pants which have drawstring waist and leg openings to assure a perfect fit. Two Cargo Pockets with Straps, two pockets on each side and one on the back round off your cool outfit! Long Sleeved Shirt "Verger" in the style of a wrap jacket by Temps Danse made of soft viscose material.Open seams and logo print on the left side of the hip. The short sleeved crop top Vrille ist from the newest Temps Danse collection. It has a wide boat neckline and ist slightly shorter in front than at the back. 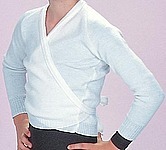 It has a roomy cut and can be worn with baggy pants, ordinary leotards or shorts. It is made of Viscose for total comfort. Tank-top with a yoke on the chest and a round neckline. Designed to be used in combination with a sports bra.From dance to yoga through fitness and Pilate, you can wear it for all your workouts. Aria beautifully fits over all leotards or tank tops. It is an essential for dance, yoga or pilates. The Tek warm-op jogging is ideal for warming up, but is also smart and trendy enough to be used as streetwear. TEK features an elastic waistband with drawstring and loose fitting for perfect comfort and ease of movement. The elastic system in the mid section of the ‘Elastosplit’ replaces materials in the mid-foot to reveal the dancer’s arch and minimise bunching underfoot. The elastic system is in an X configuration and contours to the natural lines of the foot. ES0450 features a comfortable lining that wicks moisture away and a lower heel for stability. Air punched insoles. This women's closed shoe by Merlet is very elegant because of the thin silver zig-zag line.The individually adjustable strap at the heel ensures stability.Shoes are made of suede leather with a 6,5 cm flare heel. Relaxed-leg pant with a hip-hugging drawstring waistband features pockets that are always flat and flattering to the body. Paneled camisole dress with adjustable straps. The colour red has unfortunately been discontinued. 2.5" Modern Heel. Air-Mesh Ankle Straps. Speed Buckle. Leather Lining. Deluxe Satin/Kid Skin Leather With Glitter PU/Lace Overlay. 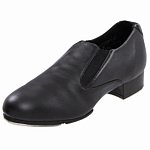 Ladies kid Skin leather open shoes featuring a 2,5" flared Modern heel with dual density top lift. The bottom layer is softer and provides shock absorption. The top layer is hard and grooved for stability and traction. Capezio® Signature Construction enhances the natural movement of the foot with engineered articulation points. Polished and refined techniques hide built-in reinforcement and comfort features without altering the look or performance. The ankle strap is fitted with a Speed buckle. A set of heel covers and a shoe bag is included in the delivery. 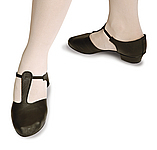 This slip on tap shoe features an elastic gusset on each side, a split sole and Teletone taps. It is a comfortable shoe with a very snug fit which does not slip at all. 2,5" heel. Leather upper. Beautifully crafted with folded edges. Tapered and full-breasted heel. Speed buckle. Capezio Signature construction. Suede sole. Women's "Running Shorts" by Capezio made from red Coolmax-Mesh lined by breathable Meryl.Sportive look because of white stripes on both sides and the Capezio Logo printed on the left side. 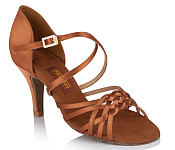 X-Straps, satin, 2.5" slim flared heel, closed toe, quick fasten buckle, leather lining, super-flexi suede sole. 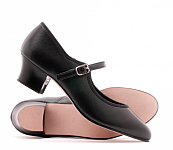 Coag, flared heel in two sizes, open toe, quick fasten buckle, leather lining, super-flexi suede sole. 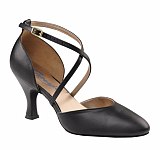 Ladies Ballroom Shoes with X-Straps, 2.75" slim flared heel, adjustable diamante buckle, quick fasten buckle, leather lining, Super-flexi suede soles. Donna Children's Cotton/Spandex long sleeved leotard with scooped neck. Sleeveless Leotard "Justaucorps Coton Lycra" by Repetto Paris. Round neck and back. High Waist Leggings "Collant Velour" von Repetto Paris. Elastic waistband. A high-tech leather and mesh sneaker with an airbag insert in the heel for optimal cushioning. The padded heels and tongue add to comfort. Casual Long-sleeved hooded Warm Up Jacket in Bolero style by Le Papillon.Spends warmth to shoulders and arms, perfect fit over Spaghetti strap tops or leotards. Black patent tap shoe "Star Tap" with ribbon lace. Comes with a 2cm low heel and Katz quality taps already fitted.Made in England. Jazz Shoe by Bleyer is a stylish eye catcher because of its bright colour in silver or gold.The inside is made of soft terry fabric, leather sole, covered heel. High Waist Cycle Shorts by Freed of London with an elasticr waistband. Made of cotton mix for wearing comfort. Sleeveless and long vest with a turtleneck. Open in the front, closed by buttons at the neck and at the belt made of rib knit.Deep armholes, LaLaChaCha-logo on the right side of the bottom.Open seams give it a casual look. Casual Jazzpants by Ginadan.Big pockets and embroidered logo in the back.Waistband and buttons. 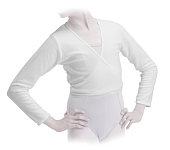 Sleeveless Leotard "June" by Adagio Ballet Wear (Gandolfi) made of soft cotton.Round neck and back.With matching belt. Girl's shoes with three way fastening strap, regulation heel and regular fitting. Women's Long Sleeved Shirt "Someone" by Temps Danse made of high quality and soft viscose material.Deep V-neck with small Logoprint.Shiny strap of Lycra in anthracite at the sides and under the sleeve.Waistband. Jazzpant "Motion" by Temps Danse made of high quality cotton.Comfortable waist with rubber band and waistband. Straight fit. Short Sleeved Shirt "Voyelle" by Temps Danse made of soft high quality viscose.White tattoo print under the v-front.There are matching jazzpants "Volodia" in our shop. Aman Peace by Temps Danse is a body cut longsleaved shirt featuring a "feminine" Yoga logo, making it a must have for your next yoga class. It features a round neck and raglan sleeves. The strech material allows for a maximal freedom of movement. Lycra (80% Polyamide, 20% Spandex) top with a flattering figure hugging cut and adjustable stretch straps. Made in Belgium. Pull-on short salsa skirt: features an asymmetrical hemline with a frill and body-hugging fit. Elegant Ladies Peeptoe in shiny silver/anthracite with double ankle strap.Comfortable 5 cm heel. High Waist Shorts by Crait by Repetto Paris made of ribbed lycra material. Comfortable elastic waistband. Sleeveless Leotard by Repetto Paris made of Satin Lycra. Tulle at the waist. Casual Warm Up Jacket by Le Papillon made of soft Supplex, sportive look.Asymmetrical cut with a zipper on the left side, gathered at the breast.Tight fit, broader sleeves and narrow cuffs. Dual-purpose top from the LaLaChaCha Collection, which was designed in co-operation with Lydia Weisser and Martin Dihlmann, who on two occasions, were runners up in the Latin-American World Championships. Sleeveless Longtop "Volante" by Temps Danse made of soft high quality viscose with two small pockets anjd a tattoo print on the left side of the hip. There are slits on both sides.Princess seam in the back.There are matching jazzpants "Volodia" in our shop. Logo T-Shirt from the "Freddy Dance Academy" Collection. X-strap satin upper, 2,75" slim flared heel, leather lining. Long sleeved turtle necked leotard with keyhole back. 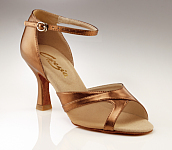 Desiree ladies ballroom shoes with closed toe and T-bar straps, 2.5" slim flared heel leather lining, and satin upper. 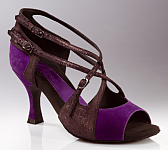 Kristina Leather Wide Fit ballroom/latin shoe, with suede sole and 2.2" slim social heel. Diamante buckle detail. 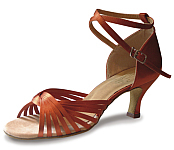 Dana ballroom/latin sandal with 2.2" slim social heel and suede sole. Leather lining. 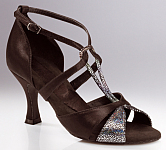 X-Straps, Flesh Satin, 2.2" flared heel, quick fasten buckle, leather lining, Super-flexi suede soles. 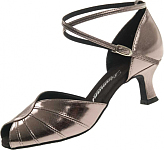 Latin dance shoe , 2.5" flared heel .Available in black nubuck with silver contrast. The Juliette shoe by Roch Valley comes with a 2.5" flared heel and features quick fastening buckle, leather lining and super-flexi soles. Made in Dark Tan Satin with a strappy cross-over front. Long Sleeved Leotard "Justaucorps Coton Lycra" by Repetto Paris.Round neck and low, round back. Sleeveless Leotard by Repetto Paris with tulle at the waist. Round neck- and backline. Long Sleeved Leotard by Repetto Paris with tulle at the waist. Round neck- and backline. Short Sleeved Leotard with tulle at the waist by Repetto Paris. Round neck and back. Short Sleeved Cotton Leotard by Repetto Paris. Tulle at the waist. Round neck and deep, round back. Wrap Up Jacket by Repetto Paris with a waist in rib knit look and small logo embroidery. Elegant Women's Peeptoe by Rumpf made of black suede leather with a double ankle strap.Comfortable 5 cm heel. A classical high top sneaker with a lightweight, durable polyurethane sole that allows dancers to turn on any surface. Camisole Leotard by Intermezzo.Straight froint and back.Supplex guarantees cottony-soft comfort, the material is shrink and fade resistant. Faster drying than cotton. 2 Hole cut out vamp featuring a two way strap and cushioned insole. It has a 2" square flare heel. 2 Part vamp with silver trim. hook and buckle fastening featuring a 2 1/2 inch slim flare heel. Ladies satin Court Shoe with, Cross Strap and luxury insock and internal fit.Flesh2½ (6.5cm) Shaped Heel. Stunning satin latin sandle with an 8 strip vamp and diamante buckles. 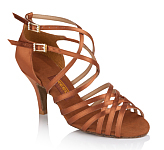 This shoe has double cross-over straps across the front of the foot and a 3" straight heel. Made in England. Flavia is an elegant satin sandle with a plaited front vamp and diamante buckle, featuring an elegant 3" straight heel. Made in England. 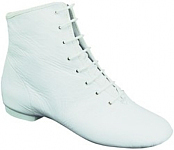 Sienna is a leather and mesh open-toe lace-up practice shoe, with suede soles. Napels is a red leather lace-up practice shoe with cut out details on the vamp. 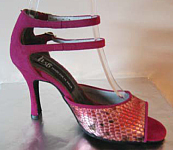 It is fitted with a 2,75" Chicago heel. Trousers with many cool details from the LaLaChaCha Collection, which was designed in co-operation with Lydia Weisser and Martin Dihlmann, who on two occasions, were runners up in the Latin-American World Championships. Skirt with straps and an a-symmetrical hem line from the LaLaChaCha Collection, which was designed in co-operation with Lydia Weisser and Martin Dihlmann, who on two occasions, were runners up in the Latin-American World Championships. Classic Jazzpant in white. Waistband with strap. Unisex kids UFO pants for mini groovers which feature: elastic waist with drawstring, cargo pockets amd fabric straps and drawstring bottoms. Double layered Top "Soft" by Temps Danse.Black Camisole Top with Lycra Ribbon in anthracite at the edge and the straps.V-front and small logo print, racerback.Lyered with short top in black.Made of soft and high quality viscose material. Black Jazzpant "Sonic" by Temps Danse made of soft Viscose material.Lycra strap in anthracite at both sides and small logo print.Waistband and band at the ankles.There is a matching Top "Someone" in our shop. Limpid Karma ist a beautiful T-Shirt with a Yoga Lotus motive. It has a comfortable loose cut but is slightly tighter around the waist so that it stays in place during your workout. Tutu by IDS. Body made of black velvet and attached black and neon tulle. Sequined Camisole Straps and neckline.